Saying goodbye can be difficult and uncomfortable, but procurement doesn’t have a choice. 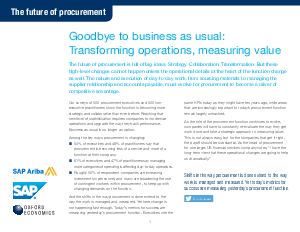 Business as usual is no longer an option, according to Oxford Economics’ future-of-procurement research. Download this think piece to see how more than 1,000 procurement executives and practitioners view the evolution of procurement, with a focus on day-to-day operations and KPIs. You’ll learn how . . .